Beginning in the late 1730s, the Shawnee Indians established one of their principal villages here. Some sixty years earlier, in the 1670s and 80s, the Shawnee had been expelled from the Scioto and Ohio valleys by the Iroquois in what historians refer to as the Beaver Wars. By the late 1730s, when the Shawnee returned to their ancestral lands, they were joined by other native peoples, such as the Delaware and Mingo, who had been pushed westward by the expansion of the English colonies. Once back in Ohio, the Shawnee aligned themselves with the English colonists on the East Coast, opening their settlement to English merchants, who traded manufactured European goods for animal furs and skins. Lower Shawnee Town was strategically located on the rivers, as well as near the Warrior’s Path, a Native American trail that ran from the Great Lakes region, south, across the Ohio River, and over the Appalachian Mountains into the upcountry of the Carolinas. Lower Shawnee Town was sufficiently west, down into the larger Ohio Valley, that few Europeans, whether English or French, were ever seen. Yet, it was also far enough east, up the Ohio River, to make trade with the English practicable and profitable. Game was plentiful; the bottom lands of the Scioto and the Ohio ideal for corn fields; and the English and French were still at arms length. Before its destruction in a flood in the early 1750s, Lower Shawnee Town was a large and prosperous trading center, with residences and cleared fields for corn on both the Kentucky and Ohio sides of the river. The English referred to the village as “Lower Shawnee Town” and because the English and their English-speaking successors, the Americans, came to conquer and settle this region (rather than the French), it is the English name by which we know it today. The “Lower” in “Lower Shawnee Town” derives from its location down river from the other Indian villages that were established higher in the Upper Ohio Valley beginning in the 1730s. As an English naming practice its usage is common along the Ohio, as seen in nearby Upper and Lower Twin Creeks, two tributaries of the Ohio near the Scioto and Adams County Line, just down river from the former site of Lower Shawnee Town. It was here at Lower Shawnee Town, that the French famously asserted their rights to the lands of Ohio. In 1749, the French sent a detachment of troops, under the command of Pierre Joseph Céloron de Blainville, down the Allegheny and Ohio Rivers to assert French claims to the lands of all tributaries flowing into the Ohio. The year previous, a powerful group of Virginian investors had obtained a royal charter for a corporation known as the Ohio Land Company, which also laid claims to lands in the Upper Ohio Valley. News of recent trade agreements between the English colonists and the Ohio Indians moved the French to assert their claims to the region via Céloron's Expedition. 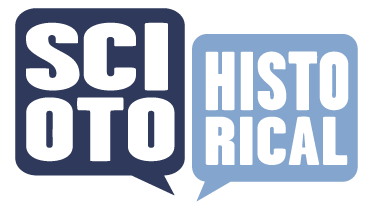 Thus, Céloron's visit with the Shawnee at the Mouth of the Scioto on August 22-24, 1749, marked the start of a new era in the region’s history; one marked by what modern-day historians refer to as the Great War for Empire (what is also still commonly known locally as the French & Indian War). This colonial era war shaped the history of the Shawnee as much as it did that of the American colonists, whose victory in the contest ensured the further expansion of English colonial trade and settlement over the Allegheny and Appalachian Mountains and into the Upper Ohio Valley. The tense meeting of Céloron and Shawnee leaders in the summer of 1749 is immortalized in the Portsmouth Flood Wall murals of Robert Dafford and its original version by H. H. Wessel (entitled, "Under the Banner of France") can be found nearby in what is now the third floor, Law Library of the Scioto County Court House. "My children, the friendship I entertain for you, although far away, has induced me to send M. de Céloron to open your eyes and disclose to you the projects which the English are forming in your regard, and that of the territories also which you inhabit. Undoubtedly you are not aware of the establishments that they are thinking of making there which tend to nothing short of your ruin. They conceal from you their idea, which is to build on your territories forts sufficiently strong to destroy you, if I would allow them to do. I ought then as a kind father who loves his children tenderly, and who, though far away from them, always thinks of their good, to give them notice of the danger which threatens them." The talks proved difficult and Céloron, who had been ordered to expel and plunder English merchants, would leave without evicting the handful of English who were living in the village at the time. Céloron, instead, choose to head down river, without burying one of his famous lead plates, which he attempted to place at the mouth of all major tributaries of the Ohio. When you visit the site of Lower Shawnee Town, you also visit the site of Abandoned Alexandria, the first American settlement at the Confluence of the Scioto and Ohio Rivers. Despite its strategic and economic advantages, the location of the Shawnee village proved to be problematic for the Shawnee and later, the Americans, who would call these bottoms home. In 1753 a massive flood overflowed both the Scioto and Ohio River banks, carrying away their log cabins, warehouses, public buildings, and undoubtedly much personal property. In the aftermath of the Flood of 1753, some Shawnee relocated to the eastern side of the Scioto, to where the City of Portsmouth is now situated, but this settlement was also abandoned by the 1760s, when the Shawnee relocated northward, up the Scioto River, to a new town site just north of modern day Chillicothe. Today all obvious evidence of both settlements is gone. Where corn has been cultivated for hundreds of years, soy beans are now planted. With the earthworks of the Moundbuilders as backdrop, the West Side bottom lands showing little trace of Indian or American settlement, and the modern-day city of Portsmouth in the distance on the higher ground of the East Side of the Scioto's Mouth, the rise and fall of human settlements here encourages a long historical perspective, similar to what French historian Fernand Braudel famously called the "longue durée." Visit Portsmouth, Ohio, and contemplate the history of the Shawnee, French, and English at the Mouth of the Scioto. Colin G. Calloway, The Shawnees and the War for America (Penguin, 2007). C. B. Galbreath, editor, Expedition of Celoron to the Ohio Country in 1749 (Columbus, F. J. Herr Printing Co., 1921). Michael N. McConnell, A Country Between: The Upper Ohio Valley and Its Peoples, 1724-1774 (University of Nebraska Press, 1992). View of the Ohio River bottoms where Lower Shawnee Town was once located. 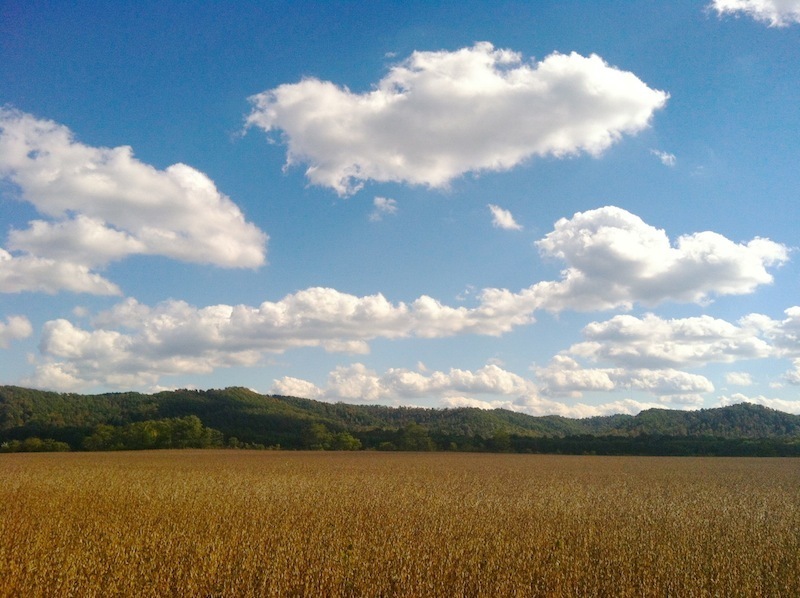 : A field of soybeans in the foreground, with the hills of Kentucky in the distance. The location of Lower Shawnee Town is found on the northern bank of the Ohio River. ~ Source: Image courtesy of Andrew Feight, Ph.D., from the Scioto Historical Series, private collection, Friendship, Ohio. Herman H. Wessel's mural, "Under the Banner of France" (1927). 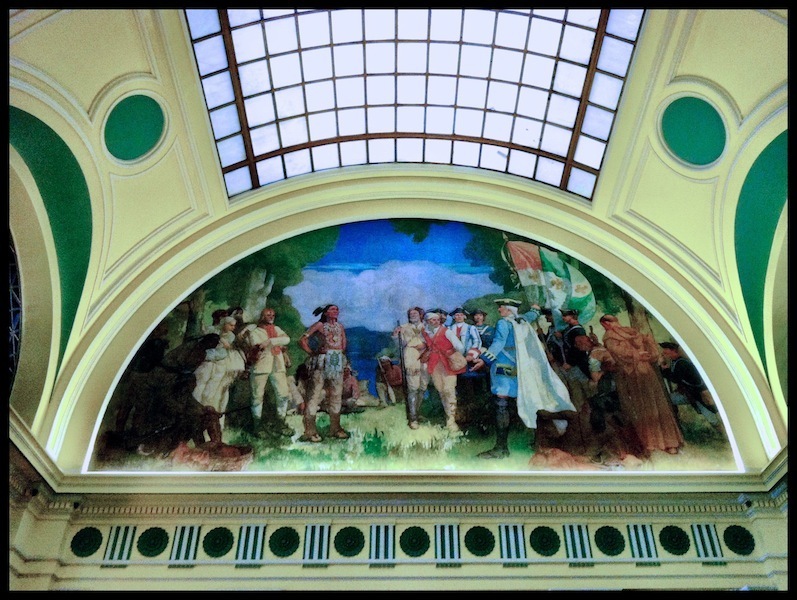 : Herman H. Wessel's mural, "Under the Banner of France," captures Céloron's meeting at Lower Shawnee Town. Painted in 1927, the mural is located in the law library of the Scioto County Courthouse, Portsmouth, Ohio. Wessel's mural served as the basis for Robert Dafford's flood wall mural of the same subject. ~ Source: Image courtesy of Andrew Feight, Ph.D., from the Scioto Historical Series, private collection, Friendship, Ohio. Andrew Lee Feight, Ph.D., “Lower Shawnee Town & Céloron's Expedition,” Scioto Historical, accessed April 24, 2019, https://sciotohistorical.org/items/show/35.